Available in English. Charts only, no row by row written instructions. A note on yarn choice. 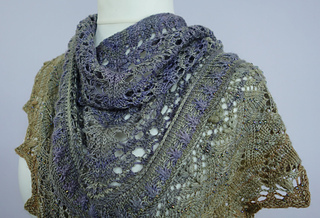 The flame stitch has elongated sts that works well with wool and wool blends. If using slippery yarn like seasilk or tencel, you may find that the elongated sts grow too much for your liking. You can work less wraps when doing the original 5 elongated stitches to avoid this. I recommend using a less slippery yarn. Difficulty: Medium to advanced. 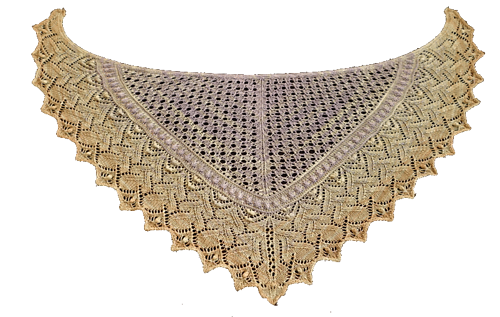 A small part of the shawl has pattern on both sides. 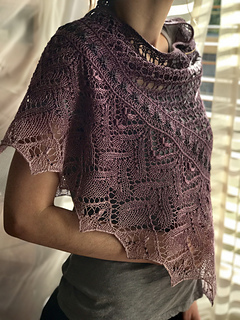 Yarn: Leeana for Earthfaire, by The Unique Sheep, 51% bombyx silk/49% merino wool, 440 yards (402 m)/100 g. 150 g or 6 mini skeins are needed to make the shawl as shown. To be sure you have enough, consider getting an extra skein. 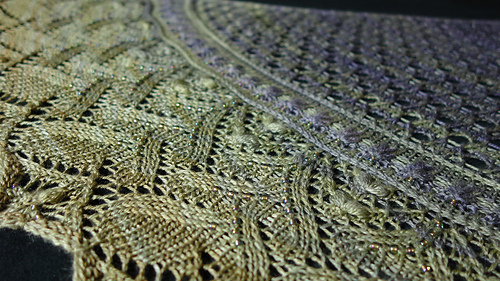 The shawl as shown is worked in the colourway “Dance of the Dryads”, using colours 7-12. 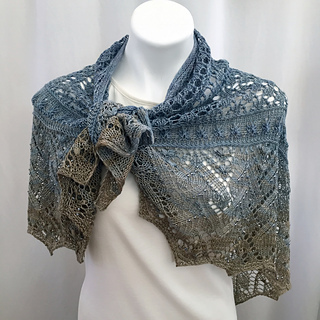 Alternatively use Kiri by The Unique Sheep, 80% superwash merino, 20% Tussah silk, 434 yards (397 m) / 4 oz (113 g). 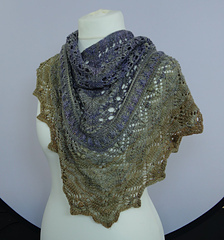 This is slightly heavier weight yarn, and you will need seven 1 oz mini skeins or 7 oz to make the same size as shown. 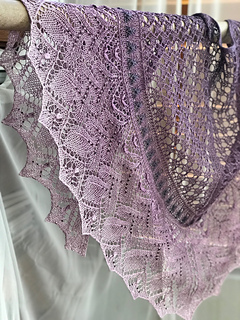 Construction: The shawl is worked from the bottom and up. The last 12 sts are either grafted together, or bound off using a 3-needle bind off. Beads: Optional. Use size 6/0 seed beads, or the size you think fits your yarn. For the size shown, you will need 581 beads. Size: As shown 26.5 inches (67 cm) deep and 49.5 inches (126 cm) wide. 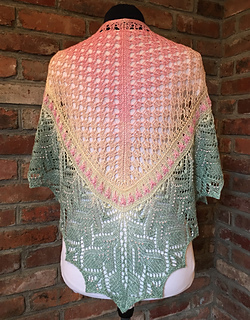 The size is adjustable, so if you want to make it larger, you can very easily by just adding repeats at the cast on edge. Remember to buy more yarn in that case. Needles and hooks: US 4 (3.5 mm) circular needle or the size you need to get a fabric you like. Crochet hook in the same size for the cast on (long tail cast on can be used instead of the crochet cast on). Spare needle in the same size if you wish to work the 3-needle bind off. Chinese Waitress Cast on with crochet hook.